The field of combinatorial chemistry has seen tremendous growth over the past decade, with a prominence that suggests it will have a continuing impact. Volume 24 in the Tetrahedron Organic Chemistry Series represents new approaches to solving problems in chemical reactivity and function. 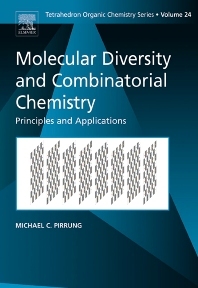 Molecular Diversity and Combinatorial Chemistry emphasises principles and exemplifies these with examples drawn from recent literature and thus is an excellent guide to the conceptual framework of the field. The textbook includes exercises and worked problems which can provide more independent learning experiences and can also be used by an instructor leading a class on this topic. This volume has been written with the advanced undergraduate and graduate student in mind. Michael Pirrung, Ph.D., was trained as a synthetic organic chemist at UT-Austin, UC-Berkeley, and Columbia University with eminent synthetic chemists Clayton Heathcock and Gilbert Stork. His independent career began in the 1980s at Stanford University and the biotech start-up company Affymax. In 1990, he joined Duke University where he founded and directed the Program in Biological Chemistry. In 2004, he joined the UC-Riverside Chemistry department as UC Presidential Chair, and in 2012 became Distinguished Professor. He has been a visiting professor at UC-Berkeley, Baylor College of Medicine, Oxford, UC-San Diego, UC-Irvine, and Caltech. He has trained over 100 graduate students and postdoctoral fellows. He has held Hertz, Sloan, and Guggenheim fellowships and a NSF Presidential Young Investigator Award. He has over 170 peer-reviewed publications, more than 40 US and international patents, and has authored six books. The scope of his research has been broad, including natural product total synthesis, photochemical methods development, mechanistic enzymology, rhodium carbenoid chemistry, microarrays, combinatorial chemistry, and medicinal chemistry. His current work emphasizes peptide chemistry. His microarray work has been particularly recognized, with the 1991 AAAS-Newcomb Cleveland Prize, the 1993 Intellectual Property Owners Distinguished Inventor Award, the 2004 Chemical Pioneer Award of the American Institute of Chemists, and the 2006 European Inventor of the Year (for small and medium-sized enterprises). His editorial board service includes Cell Chemical Biology and Journal of Combinatorial Chemistry. He has worked extensively with development-stage and Fortune 500 companies as a consultant or scientific advisory board member. He also has an active practice as an expert witness for litigation in nucleic acid diagnostics and generic drugs.